Floating device that attaches to pump outlet allowing for winter water circulation and oxygenation. 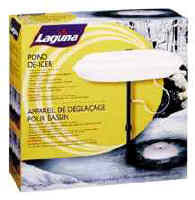 Keeps ponds open during winter to allow oxygen/gas exchange. Riser accepts 3/4" tubing.